AWESOME VIEW ON THE SEA !!!! Property 3: AWESOME VIEW ON THE SEA !!!! House On 2 Levels, Luxurious Garden, Outside Shower, Stunning View! Property 9: House On 2 Levels, Luxurious Garden, Outside Shower, Stunning View! 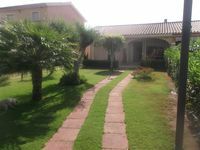 Property 15: Elengant typical house with garden, quiet zone, near beach and center city. Beautiful Cottage with Private Gardino 250 meters from the Sea !!!!! Property 18: Beautiful Cottage with Private Gardino 250 meters from the Sea !!!!! Seafront house with private entrance to the beach. Property 21: Seafront house with private entrance to the beach. The house on the Gulf. House overlooking the beautiful Poetto coastline. Property 23: The house on the Gulf. House overlooking the beautiful Poetto coastline. Villa overlooking the sea at 100 meters from the beach. Internet WiFi. Geremeas. Property 24: Villa overlooking the sea at 100 meters from the beach. Internet WiFi. Geremeas. Relaxation and freedom by the sea! Property 26: Relaxation and freedom by the sea! La Terrazza sul Porticciolo and the "Residenza la Piazzetta"
Property 34: La Terrazza sul Porticciolo and the "Residenza la Piazzetta"
We were satisfied, a lot of space for 4. Nice appartment near Cagliari but without its noise. The apartment was extremely comfortable with all necessities available. Kitchen is totally equipped. Very spacious with patio and patio furniture. 3 a/c &lsquo;s in unit so it was quite comfortable as it was really hot outside. Grocery store and bus stop 3 minute walk. Giovanni was very helpful advising us as needed. I would have given a 5 star rating but the walk to the beach was a lot longer than indicated on the web site. It really takes about 25 minutes not 10. We did not have a car and I really wanted to be closer to the beach. So that was my only disappointment.